It is always fun to find a great complementary color pairing that you can wear over and over again. I wanted to show you guys some of my favorite colors to mix together as well as showcase this super fun and colorful top from J.Crew Factory. With all the different colors I showed you will be sure to find one that you love and can incorporate into your everyday wardrobe. I think my favorite is the bubblegum pink and turquoise; it is such a bright fun combination. 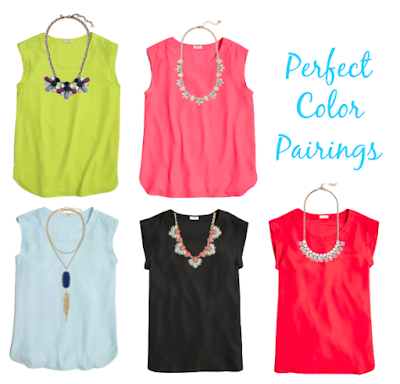 Also, I know this is the last thing everyone wants to hear at this point in this summer, but the simple colored tee paired with a fun statement necklace makes the perfect back to school outfit. Comment and let me know your favorite color combo.